Summary: FROM THE AUTHOR OF TEN BEACH ROAD AND OCEAN BEACH, A NEW NOVEL OF FOUR FRIENDS—AND A SHARED PASSION THAT COULD CHANGE THEIR LIVES. Review: As an avid, borderline obsessive fan of Downton Abbey, I knew I had to read this book. Not to mention this sounded like the perfect chick-lit to get lost in for a while, forgetting about classes, tests, and life in general. And just like the show, this book had so much charm that it was impossible to put down. England native Edward Parker, the concierge of the illustrious apartment building The Alexander, takes his job very seriously, and he can't think of a more perfect way to make his residents come together than organize Sunday night screenings of Downton Abbey. At these screenings, residents Samantha, Brooke, and Claire could not be more different, but these women bond over the beloved show and become quick friends. Each woman is going through their own person crisis, and they find themselves leaning on their newfound friends for support they never knew they needed. The first thing I loved about this book was, of course, all of the references to Downton Abbey. Since I've seen every episode, I knew what the author was talking about when the ladies would discuss that night's episode and the characters they could connect with. Watching the women bond over a show I love so much was so heart warming and I found myself bonding along with them, becoming a part of each of their lives. While the three women all love the same show, they are all so different and lovable in their own way. Brooke's the newly divorced, single mom with the jerk ex-husband, Claire is newly full-time writer who just can't seem to find the right words to put onto a page, and Samantha seems like she has the perfect, rich life but in reality has a rocky past and not-so-solid relationship with her gorgeous husband. Despite their differences, they actually really care about each other and I loved how much they were able to go to each other for help and support. Not to mention the diverse characters of the story always gave you something new with each turn of the page. Overall, this was a sweet story that in the end left you feeling all warm inside. Each of the women in the novel are going through rough times in their lives, and it's nice to watch them try to figure everything. There is something in each of their lives that any reader can connect to, and the concierge Edward adds a British charm that you can't help but smile at. If you're looking for a light, fun read that revolves around one of the best shows of all time, I'd definitely recommend picking this one up. 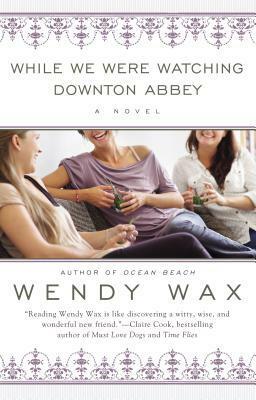 Even if you're not a Downton Abbey fan, Wendy Wax delivers a charming chick-lit bound to touch the heart of anyone who reads it.